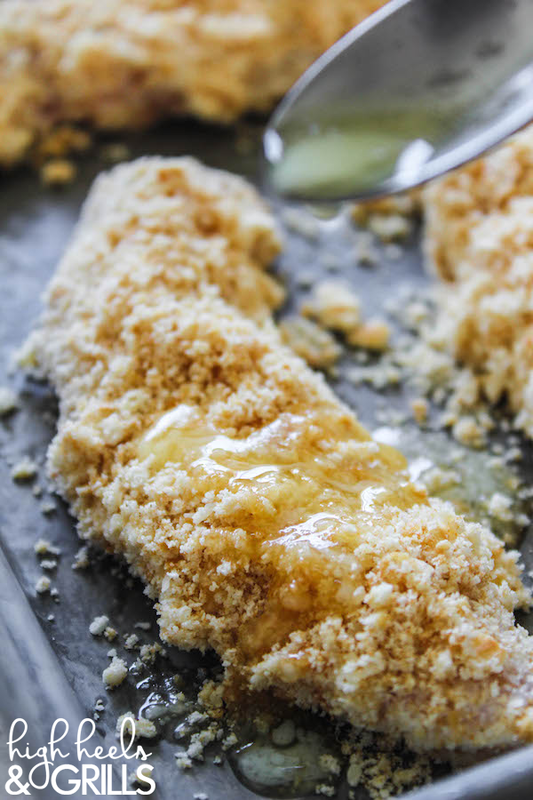 These Baked Ritz Garlic Parmesan Chicken Strips are dipped in yogurt, smothered in Ritz cracker crumbs mixed with garlic salt and parmesan, and drizzled over with butter. 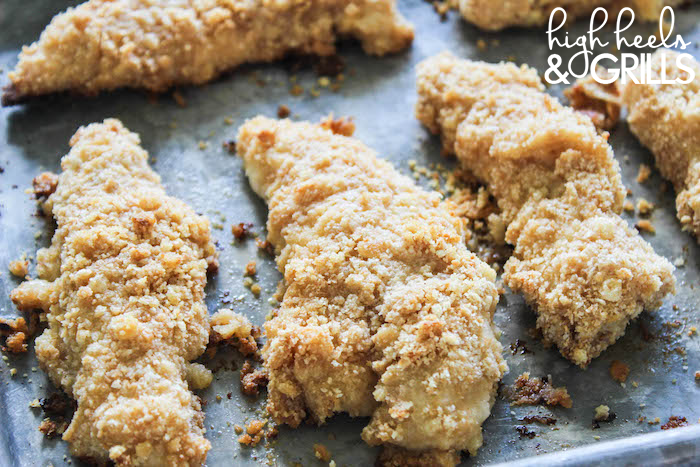 They are the perfect dinner recipe for those picky eaters in your life. Everybody you know will love them! Is dinnertime as rough for you some days as it is for me? I’ve always considered Addi to be a pretty good eater, but lately, that seems to be changing a little bit. I did read somewhere that for toddlers, it’s common for them to have only one good meal out of the day. So, I guess that makes me feel a little better. Sort of. 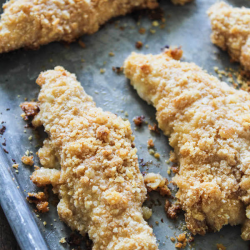 Then, I went home to my parents’ house last month and my mom made us these Baked Ritz Garlic Parmesan Chicken Strips and she gobbled up almost 2 strips on her own. Umm, what? So, of course I had to get the recipe. And of course, I had to make it right away. And of course, Addi ate it just as well at home as she did at my parents’ house. It was like magic! My siblings and I are all obsessed with this recipe and we don’t know a person that has eaten it and not liked it. I guarantee that you will see the same results! Hopefully it will help with your picky eaters, just as much as it has mine! Salt and pepper your chicken, to taste. Place the yogurt in a small bowl. Combine the Ritz crackers, Parmesan, garlic salt and seasoned salt in another small bowl and mix well. 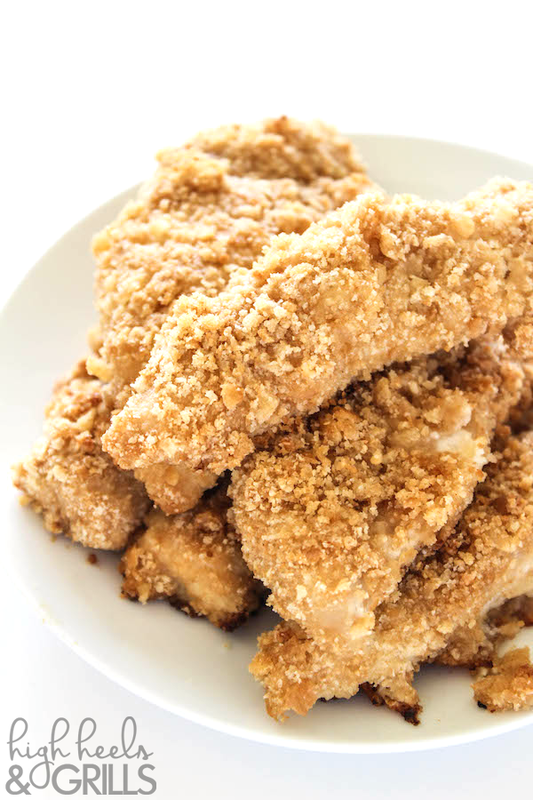 Dip the chicken in the yogurt to coat completely, being sure not to coat too thickly. 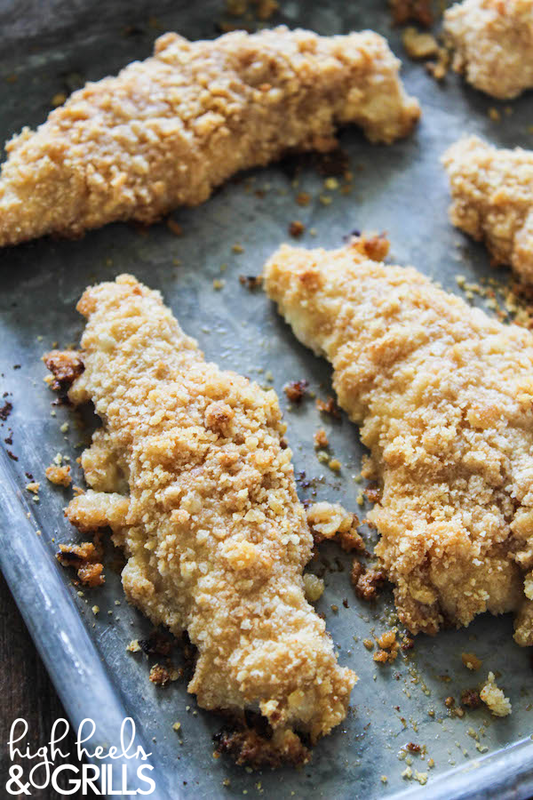 Dip the chicken in the crumb mixture and place on a baking dish. Repeat with all chicken pieces. Drizzle the butter over all the chicken pieces.